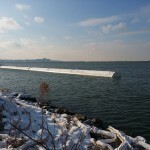 With Great Lakes Shipyard custom designed and fabricated floating breakwaters, you are ensuring that boats and docks in the marina basin will be protected from heavy weather. If you can dream it, we can build it. Together, we bring your vision to life by following a comprehensive process that ensures your floating breakwater project is customized to fit your needs and is built to exceed your expectations. 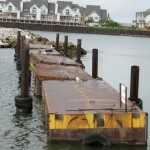 After years of use, the old breakwater at Perry’s Landing Marina was starting to rust and sink. Fabricate five (5) new 40’ long x 5’ wide x 8’ deep sections bolted together to create a 200’ long floating breakwater ballasted to the 4’-6” waterline. 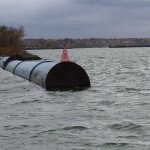 The old breakwater at the Whiskey Island Marina broke free, washed ashore and was damaged during Hurricane Sandy. 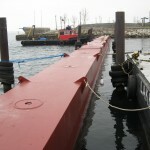 Fabricate two (2) 150’ long x 9’-6” diameter steel cylindrical modules and bolt together to create a 300’ long floating breakwater ballasted to the 6’-6” waterline.